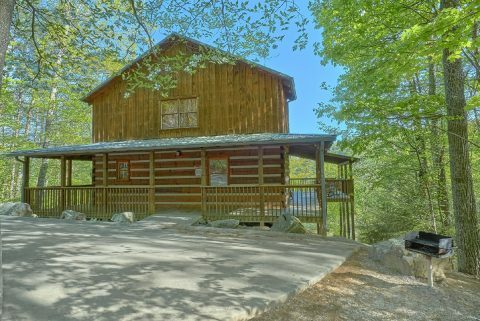 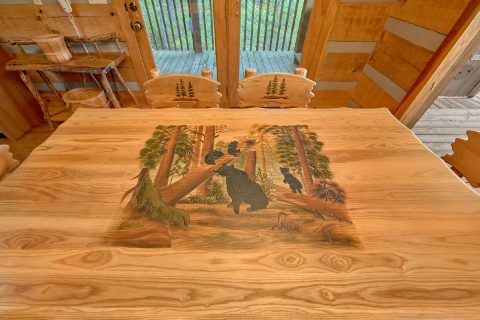 Located in a secluded location just off of Bluff Mountain road in the Smoky Mountains, you'll find "Mountain Glory," an excellent 2 bedroom cabin that sleeps up to 4 guests in comfort! 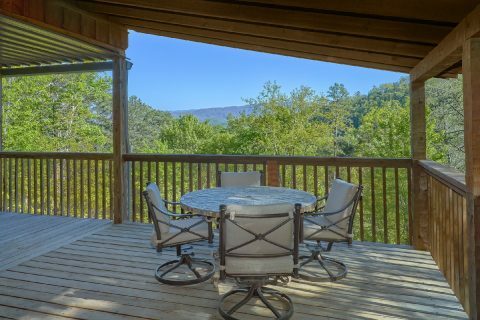 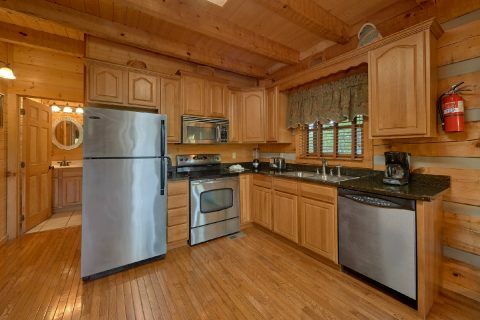 From this cabin's scenic, forested location, guests of this rental will enjoy being only a 5.5-mile drive from the action-packed Pigeon Forge Parkway! 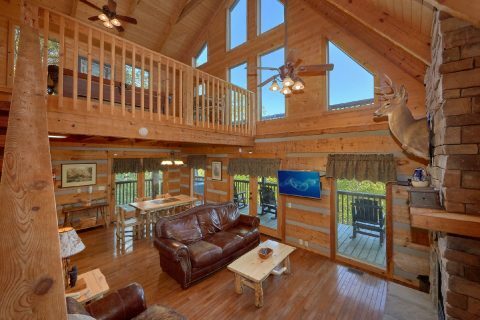 With excellent attractions like The Island, The Coaster at Goats on the Roof, and the Historic Old Mill within easy reach, you'll have no trouble finding fun things to do and see during your vacation! 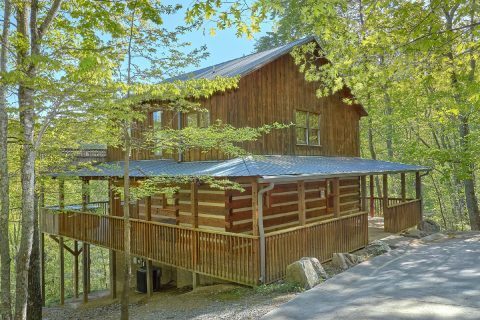 Additionally, this cabin is only a short drive from the picturesque Wears Valley area, where you'll find lots of charming mom & pop shops and restaurants. 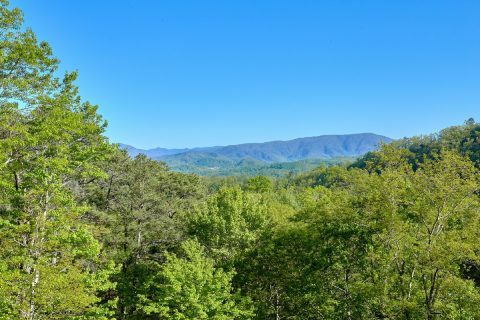 Wears Valley is also home to an entrance to the Great Smoky Mountains National Park, so you can enjoy easy access to the natural wonders of the Smokies. 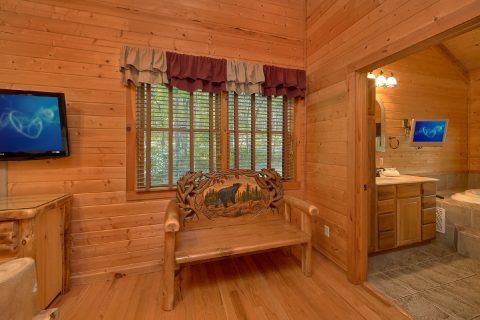 Back at your cabin in the mountains, you'll find everything you need to unwind in comfort and style! 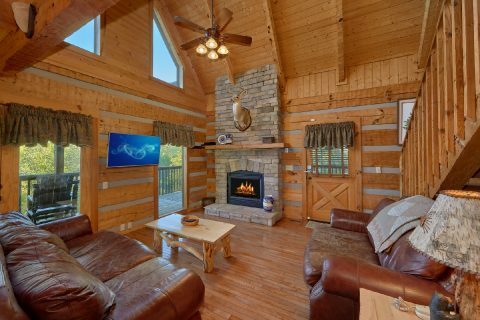 On the main level of your cabin, you'll find a warm, double-sided gas fireplace that can be enjoyed from both the living room and wrap-around porch. 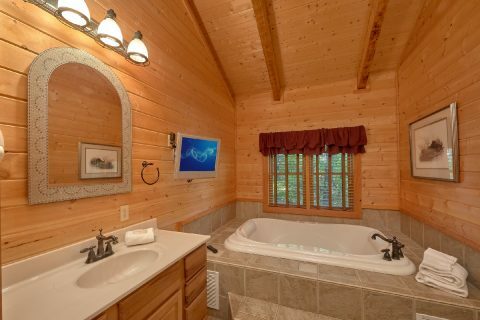 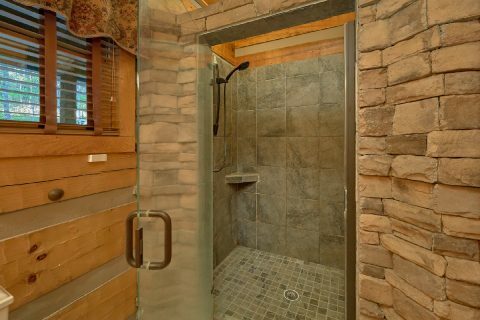 Nearby, your cabin also provides a hot tub for taking a soothing dip while you enjoy the fresh mountain air. 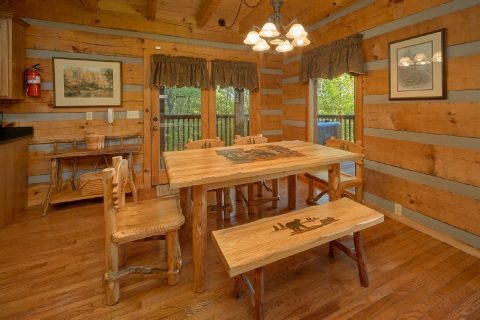 Your cabin also provides a nice mountain view, so you can take in the scenery while you enjoy a cup of coffee in the morning. 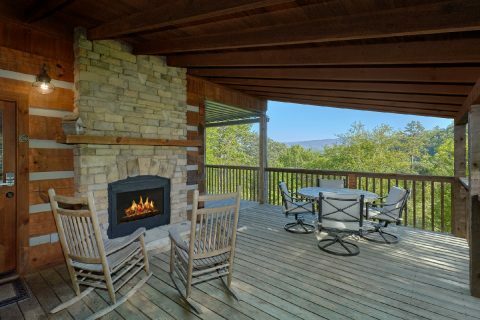 For even more relaxation in nature, you can enjoy a beautiful evening under a starry night's sky at this cabin's fire pit area with a charcoal park grill. 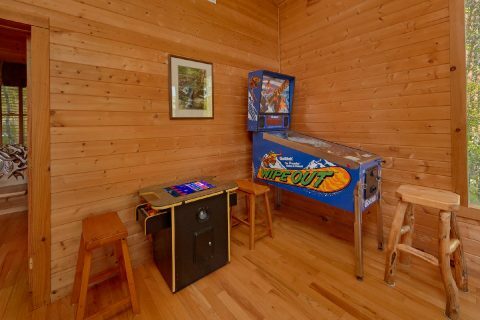 In your cabin's upstairs game room area, you'll find plenty of entertainment with the pool table, two arcade games, and even a checkers table! 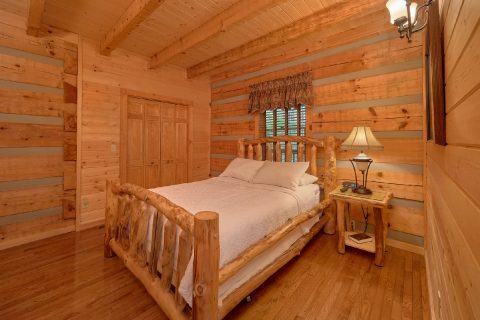 With your cabin's two private bedrooms, you'll have plenty of comfortable space to stay rested during your vacation in the mountains. 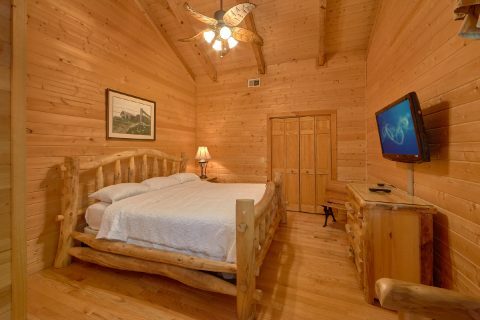 The main level is home to a queen-sized bedroom and there's a nearby full bathroom with a double-sink vanity and a stand-up tiled-in shower. 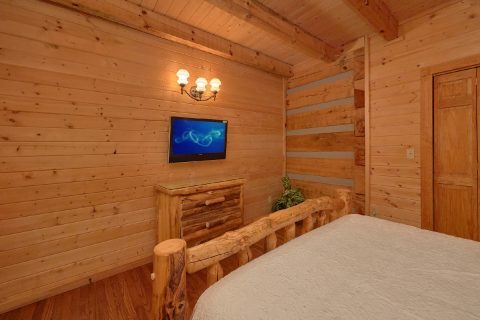 In the upper level of your cabin, you'll find a king-sized bedroom with a private bathroom complete with a jacuzzi tub. 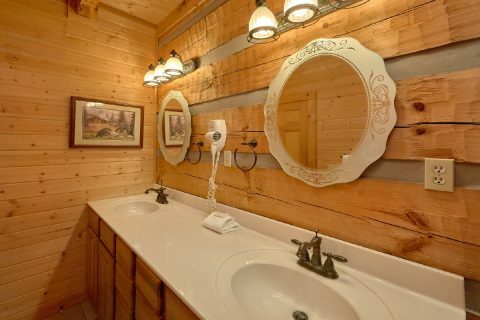 Please note that this bathroom does not have a shower or regular tub. 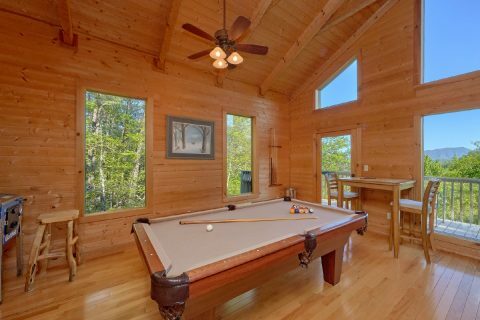 Altogether this cabin can easily sleep up to 4 vacationers. 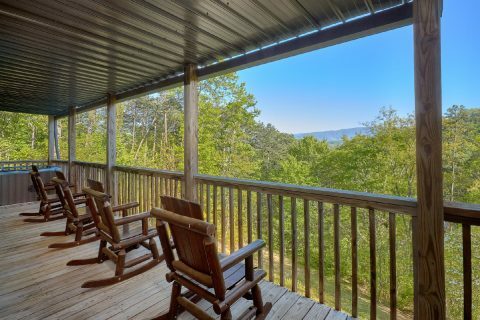 With practical amenities like a full kitchen, WiFi Internet access, a washer/dryer, a charcoal grill, and an easy to access round-about driveway, this cabin has plenty of features to make your stay simple and care-free! 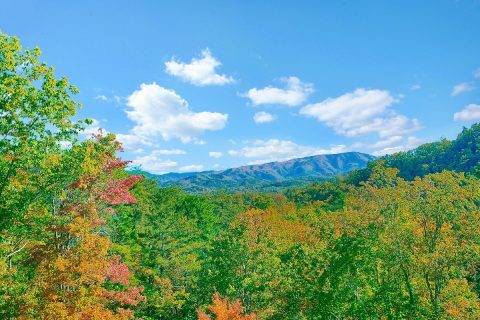 Book "Mountain Glory" today with Cabins USA to start planning an unforgettable vacation in the Smoky Mountains! 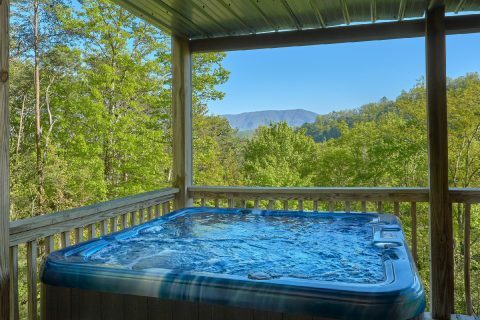 Better yet, you can save 15% on your nightly rate in the Smokies with our special cabin discount!